●Duration of journey: 6 days, 5 nights. 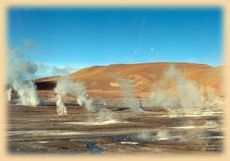 ●Visiting: Salta, Tucumán & Catamarca Provinces over one of the most arid areas of the world: the Puna of Atacama region, Salta city, Calchaquies valleys, Cafayate wineries, Santa María del Valle de Yocavil, Antofagasta de la Sierra, Antofalla, Salar del Arizaro, Pocitos, San Antonio de los Cobres, Abra de Acay, Cuesta del Obispo, Los Cardones National Park, Cachi, La Poma. Day 1: Into the Calchaquies Valleys. We start in Salta city, and our first destination is the Calchaquies Valleys area. To get there, we will go over a wonderful gorge called "quebrada del río Las Conchas" where we will see many colours on the sandstone formations made by wind and hydric erosion. When we leave the gorge, after driving 120 kms, we will get to the valley and the first city is Cafayate (10.000 habitants) where we will lunch and visit one of the wineries. After this, we shall continue over our last 54 kms of asfalt road to get into the Tucumán Province, to Quilmes Inn (double rooms with private bathroom): after checking in we may visit the local ruins. 2.000 mts. above sea level . Day 2: Into the Puna. Leaving Quilmes we continue now on a earth road until the last day of this trip. Few kilometers after, we get into Catamarca Province, crossing on the way an important city called Santa María del Valle de Yocavil, after that, a few small villages carry us up into the altitude above sea level. The landscape becomes arid every hour of the trip. Mountain roads with huge climbing sand dunes are the scenery of the way to get to the edge of the Puna region, the big mountain plateau at 3.500 mts. above sea level. 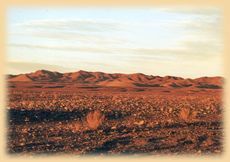 The road now is straight over the desert and the wild life (vicunas and foxes) show us where we are: "in the middle of nowhere". 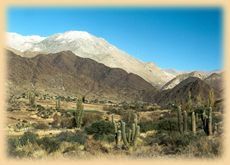 After many hours driving we will get to village call Antofagasta de la Sierra, situated in the area of volcanoes landscape. To get there, the road go over old lava flow of black stones, and many times ask yourself in which planet should you be. It`s hard to explain........ Check at the Antofagasta de la Sierra hotel in double rooms with private bath. Day 3: Into the old hell! What's that?......don't worry it's just an old volcanoe called "Galán" with a huge crater of 40 kms. of diameter, and in this crater there is a big lagoon called "Diamante" beside a mountain of 6.000 mts. above sea level high!. I promise..........it's true. This will be the hardest day because we shall drive over 12 hours, stopping only to take a pictures and pic nic. The highest point with our 4x4 will be 4.800 mts. above sea level, and we will get back to Antofagasta de la Sierra at night. I know.it's hard to stay many hours in the truck, but let me tell you it's worth it. It will be a real experience of a 4x4 expedition running only over miners path. After this day, everything will be a "piece of cake", and when we'll see again an earth road, it will look like a highway. Day 4: Over the Salt Flat. Leaving Antofagasta de la Sierra, we continue to the west where we will get our first salt flat "Antofalla". Let me explain "Salt Flat" means a flat area with pure salt........ How? : the natural salt of the earth in the mountains around, during the rains transport sediments to the lowest level of the landscape..........them after millons of years of this process and the evaporation under strong solar radiation, salt concentrates and actually we can see these salt flats. "Antofalla" is a nice one and we can see like islands the lava flow from the old Antofalla Volcano (snow caped in the back ground). After crossing over to one of the sides, we get to another small village of the same name where we will lunch in a family house sharing life with local people. 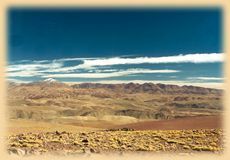 After lunch we continue and we get back into Salta Province, and we shall cross the biggest salt flat in Argentina: Salar de Arizaro. The path to cross it's runs 85kms on pure salt. During the first part the salt is white and then it's red. It's means you can get a sensation of staying on the moon first and then in mars. All in the same day and cheaper than on a space tours!. The space trip finished in Tolar Grande, a small village and a train station. We shall sleep in a new french-argentine refuge with 2 big rooms with 20 beds each and one bathrooms with hot showers to each big rooms. Between the rooms there is a kitchen and dining-room where we shall breakfast. Dinner will be in a family house of local people. Day 5: Over the highest pass of América. Leaving Tolar Grande, we go to into a dream: The "Valley of the Dreams". Red mountains of sandstone, strange rock formations and a few salt flats make a strong constrast of colours hard to explain. It's just a dream, but we are in it. 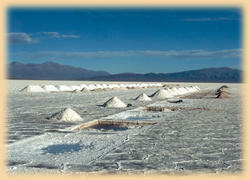 After the Valley area, there is another salt flat call "Pocitos", then we climb to get to 4.500 mts. above sea level and when we finish the way down gets us to the village of San Antonio de Los Cobres (famous because of, the Train to the Clouds stop). After lunching in a restaurant we continue climbing to get to the highest pass of any national road of the Americas: The Abra del Acay at 4.900 mts. above sea level. The landscape of the way down is amazing.....we are getting back to The Calchaquíes Valleys again but over the northern part (on the second day leave de valley towards the puna region over the southern part). 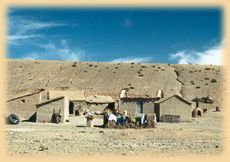 The first small village shall be La Poma (part of it was destroyed by the earthquake in 1930) and then, 2 hours later we get to Cachi city........something strange on the road,......something dark and smooth to drive on. IT'S ASFALT!!!!! Check in into Cachi Hotel in double rooms with private bath. Another long day is finished. Day 6: Back to civilization. Today we can wake up late!!! !, breakfast in the hotel around 9:00 hs, then we check out, we walk to the main square of the village to visit the historic church and the archeological museum. After buying "empanadas" (regional food) we start the trip back to Salta city. On our way we stop at the National Park Los Cardones (cactus park) to pic nic empanadas . 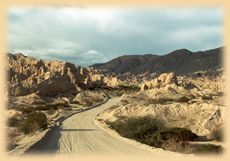 We later descent toward the Lerma Valley where is Salta city through the mountain road called "Cuesta del Obispo" (in 20 kms. we go down 1.000 mts.). Back to civilization in Salta we finish our 6 amazing days, exiting and unforgettable experience facing with a nature into the heart of one of the most beautifull areas of The Andes Mountains in South America. The overnight of this day it's not included on the trip. ● Includes: all included: meals(not drinks) and accomodations. ● Not Included: 6th overnight stay in Salta city, drinks and beverages, tips to the guides and extras.